John William Waterhouse was born in Rome in 1849, the same year that the Pre-Raphaelite Brotherhood was formed. He was thus one of the last of the artists associated with that movement. Painting at the relatively mature age of thirty-nine (the average age of D G Rossetti, Millais and Holman Hunt was only twenty at the inception of the PRB), he was able to produce in The Lady of Shalott (1888) what is one of the finest and certainly the most recognizable examples of the genre. It is not, though, strictly faithful to the original precepts of the PRB, which were to revert to simple representations from nature, avoiding Raphael’s ‘Grand Manner’. Regarding general subject matter for the Brotherhood, recurring themes were young women, frequently tragic heroines in heroic poses. Often, the figures would be dressed alluringly in simple clothes. Perhaps this was a reaction to the truly hideous dress of Victorian women of the period. Later on, around the time that The Lady of Shalott was painted, William Morris had written about (Victorian) women being ‘…upholstered like armchairs…’ So, along with the PRB’s avowed aim of the use of brilliant colour, complex composition, natural subjects, ‘flat’ lighting and precise detail, might have been added the requirement to represent women as sensual beings, long hair down, and all curves on display (although rarely, if ever, unclothed). On the question of tragic heroines, Waterhouse had some new subjects to choose from compared with those available to his earlier ‘Brothers’. The emergence of Grand Opera in 1820s Paris had produced, as it matured, some wonderful subjects. There was Marguerite from Faust, a fallen virgin saved from Hell and Damnation at the last moment by a choir of angels; Senta from The Flying Dutchman, who cast herself off a high cliff in order to redeem the soul of the cursed Dutchman; Brünnhilde from The Ring cycle, who rode her horse into the funeral pyre of her lover Siegfried; even the most tragic of them all, Wagner’s greatest heroine, Isolde, who died after singing the Liebestod or ‘Love-Death’ over the dead Tristan. All of them would have made great dramatic pictures. It is noteworthy, and a question to ponder, that none of these were chosen by the later Brotherhood as subjects. Perhaps the PRB could not afford to attend the opera. 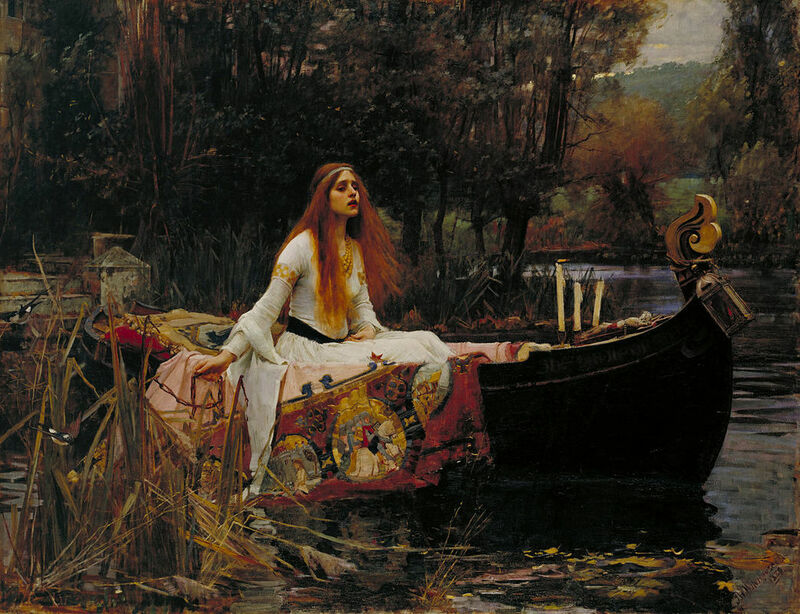 So in his choice of subject, Waterhouse probably sought to exploit the popularity of the poem. The painting shows the point at which, having left her tower and found a boat, the Lady looses the chain securing the mooring preparatory to sailing down to Camelot. The whole composition is sumptuous, and along with Ophelia, (Millais, 1852), is one of the best-known of what we think of as Pre-Raphaelite painting. Considering the aims of the Brotherhood, the requirements are generally met. The colours are superb; the detail of everything from the tapestry folded over the side of the boat, down to the individual water-plants and leaves and the twig in the bird’s mouth is meticulous, and the subject is lit as though it were a film set. The lady herself, is dressed in simple virginal white with long red hair (hair down, but not sumptuous – this is no femme fatale), and has such an expression of tragic resignation as must have brought tears to the eyes of many an introspective viewer of the work. There is a lighted lantern affixed at a realistic slant to the prow of the boat, but behind this there are three candles in holders and a crucifix draped by a rosary forming a sort of altar. This emphasizes the Christian devoutness of the lady, however it also assists the visual allegory. Two of the candles are unlit, presumably having blown out, but one still burns with its flame horizontal in the wind. The phrase ‘candle in the wind’ was certainly in use by 1914, and there is a reference in The Morning Chronicle of 1861 to: ‘…extinction…like…a candle by a blast of wind…’, so the metaphor for the lady’s imminent death is perhaps a little obvious. Slightly more subtle is her loosing of the mooring chain, indicating her casting herself free from the constrained life she had had to lead until that point. But to over-analyse is to dissect, and to dissect is to destroy, so it is appropriate to conclude that the work is a glorious feast for more than just the eyes – if the poem is read during viewing – and stands as, if not the culmination of the philosophy of the Pre-Raphaelite Brotherhood, then one of its best consequences. 1. I have consulted Gombrich, The Story of Art, for background on the philosophy of the Pre-Raphaelite movement. No actual criticisms of the painting were consulted, deliberately (other than the Wikipedia article), in order that the critical assessment of the painting should be mine alone. Research on the origin of the phrase ‘Candle in the Wind’ was conducted by scanning digitised historical newspapers available on the internet. 2. A special journey to the Tate Gallery to observe the painting in question was thwarted on discovering that not only had it been lent to the Royal Academy for an exhibition, but the exhibition had ended the previous day. The painting was in transit and unavailable to view for at least a month! Since the above text had already been partly written, I elected to continue nevertheless with it, rather than choosing one of the alternatives on view at the Tate, mainly because I find The Lady of Shalott such a wonderful subject. 3. (Added April 2018) The lady’s mouth is slightly open, and I have seen it written somewhere that she is singing ‘…her last song…’ I did not remark this when I originally wrote the essay, although Tennyson’s poem says in the previous stanza that: ‘She loosed the chain, and down she lay;’ so strictly speaking she was lying down before she started singing. Nevertheless, Waterhouse probably intended that she was singing, a point I missed at the time.